It's doughnut week here on NDP. First up were these sufganiyot filled with the best cranberry mousse of your life. Now? 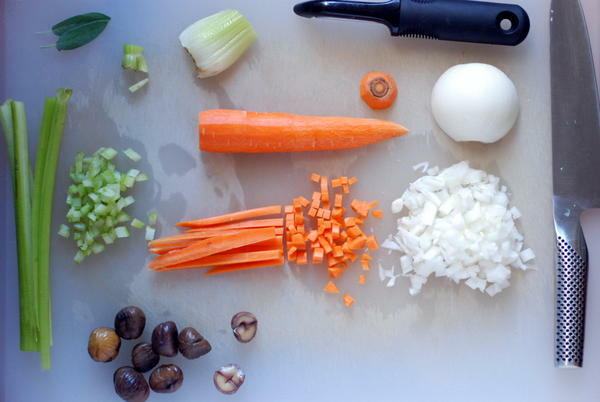 We're going savory. Please welcome my friend and cook extraordinaire, Josh Resnick, who's sharing his unforgettable cornmeal doughnuts stuffed with stuffing. Ever since we tried them, we haven't been able to stop thinking about them. I tested them this past weekend, and while Josh's came out better than mine, even my amateur version was quite delicious. These doughnuts are not to be missed.
. We have been hosting my wife's family and part of my family for the last three years, so to us, this holiday has already represented a melding of two families' traditions. A mashup like this would fit right in. So, despite being in the midst of Passover prep, I went into menu planning overdrive. That's normal, right?
. But that's just the beginning. , or jelly doughnuts, the ubiquitous dessert of Hannukah, seemed like the perfect canvas for a mashup. Once you take out the jelly, you can really stuff them with anything, sweet or savory. 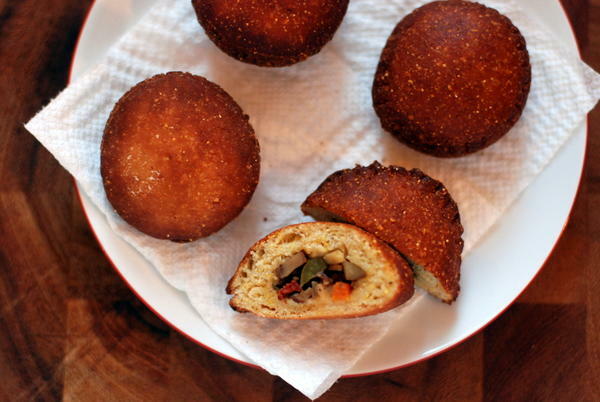 After some tinkering, I settled on cornmeal doughnuts with chestnut sausage stuffing. For this home cook, it has been the answer to the question I didn't even know to ask: shouldn't more doughnuts be made with meat? A few notes on ingredients. I used stone ground cornmeal for some classic cornbread texture. I also added wheat gluten to make sure the doughnuts were chewy. If you don't have wheat gluten and don't feel like buying it, I would use bread flour in place of all-purpose and replace the gluten with an equal volume of cornmeal. A note on technique. A clean edge is critical to the shape of the doughnut and to making sure the stuffing stays...well, inside. 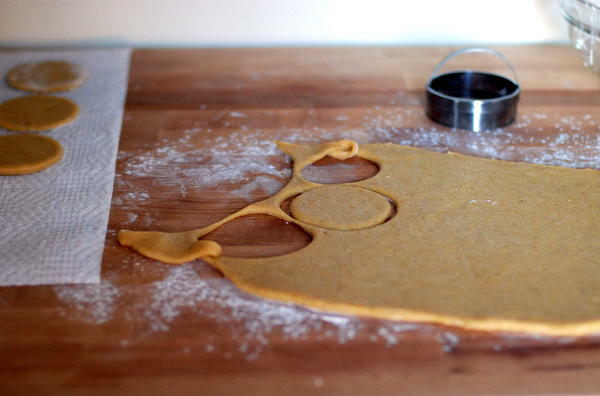 After filling the doughnuts, stretch them out a bit and recut them with a biscuit or cookie cutter. This will ensure a good seal and a clean edge. You don't want your filling leaking out, and you're not looking for something beignet-shaped. Rivka again here. Don't skip the recutting step! Also, don't skip this recipe. As you can see and understand, we're kind of obsessed. First, make the dough: Combine yeast, water, and 2 teaspoons sugar in the bowl of a stand mixer. Let sit for 10 minutes, until yeast turns foamy. Add the remaining ¼-cup of sugar, wet ingredients, and salt to the bowl. Hook in the paddle attachment and mix on medium speed until combined. In a separate bowl, combine flour, wheat gluten, and corn meal. Add to the wet ingredients and mix with the paddle attachment about 30 seconds, until fully combined. Then switch to the dough hook and need for two more minutes. The dough will be a bit sticky, but it should start to pull away from the sides of the bowl slightly. If it doesn’t, add flour by the tablespoon until it does. Scrape dough into a lightly oiled bowl and cover with plastic wrap. Let rise for at least 2 hours at room temperature, until doubled; alternatively, transfer to the fridge and let proof overnight. 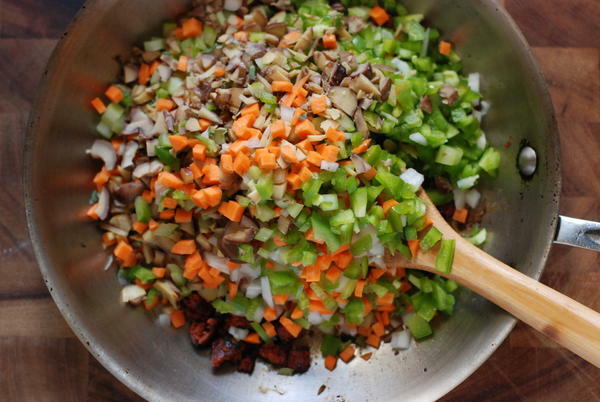 Make the stuffing: Put olive oil in a large sauté pan set over medium heat. Add sausage and cook until the fat starts to render and the meat starts to crisp, about 5 minutes. 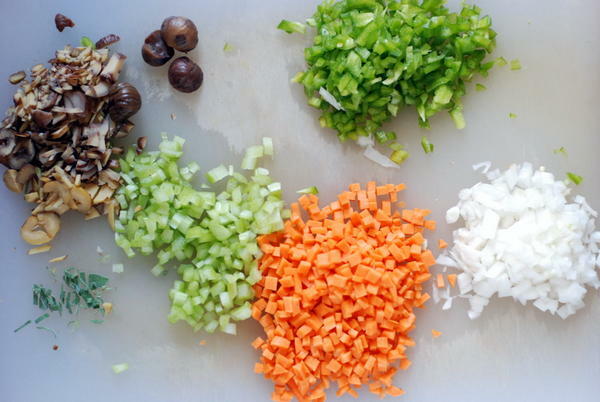 Add remaining ingredients to the pan and sauté until vegetables have begun to soften, about 5 more minutes. Then add 2 tablespoons of water to the pan, cover with aluminum foil, and cook on medium heat until water as evaporated and vegetables are mostly soft, about 7 minutes. (The carrots should still have the slightest resistance). Cool completely. Form the doughnuts: On a lightly-floured surface, roll dough into a rough rectangle, ¼ inch thick. Using a 3½-inch biscuit cutter, cut into rounds. Re-roll and cut remaining dough until all dough is used. Brush each disk with water. Top half of the disks with 1 ½ teaspoons of filling. Set one untopped disk over each topped disk and press firmly around the edges to seal, stretching the edges of each doughnut slightly while sealing; after all doughnuts are sealed, recut each doughnut with the 3½-inch cutter. The cutter does the best job of creating a firm seal. Place doughnuts on paper towel, cover with a second paper towel, and let rise 45 minutes-1 hour. Fry the doughnuts: Line a large plate with two layers of paper towel. In a large pot, heat 3 inches of canola or other neutral frying oil to 350 degrees. Fry doughnuts about 75 seconds per side, until golden brown. Transfer to the paper towel-lined plate and drain.